Eight authors coming together and providing short stories for an anthology. Eight short stories overflowing with romance. 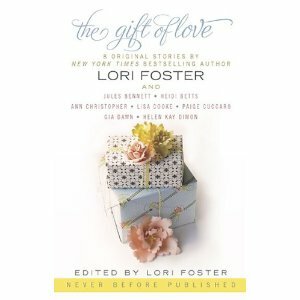 The Gift of Love is an anthology of eight romances written to support a charity. Brodie Grant had not returned in time. His sister married that lying Leo Stover. Granted he had been gone for ten years, but he never expected to return to this. Or for a fully grown up Maggie Stover Walls, his former best friend's younger sister. Maggie could not believe that good-for-nothing Brodie had returned. As a young girl, Maggie had always turned to her older brother's best friend, but he had devastated her family then ran away like a coward. She absolutely did not want or need him in her life. When Maggie's horse returns riderless, it is only the skills Brodie had gained as a tracker over the past decade that can save Maggie. The Redemption of Brodie Grant was a romance of finding the truth behind the lies, forgiveness and redemption. I enjoyed watching Maggie's infatuation blossom into love, and Brodie's realization of deeply buried feelings. Included in The Gift of Love are: For the Love of Wendy by Lori Foster, Ava's Haven by Jules Bennett, Skin Deep by Heidi Betts, Atticus Gets a Mommy by Ann Christopher, The Redemption of Brodie Grant by Lisa Cooke, The Wolf Watcher's Diet by Paige Cuccaro, A Fairy Precious Love by Gia Dawn, and Second Time Around by HelenKay Dimon. FTC Disclaimer: I did receive an ARC of the book from the authors. However, this website only posts "good" reviews. If I cannot post a positive review, I notify whoever has provided me with the book/ARC/ebook.